Successfully Added Hi-Def Multimedia Center - Network HDD Player to your Shopping Cart. 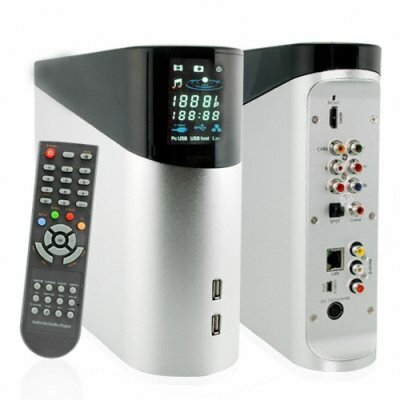 Home digital media center with high definition (720P) output directly to your TV screen. The ultimate wholesale Hi-Def multimedia player for todays home entertainment center. Finally, a multimedia center that allows you to enjoy all your digital media on your new big flat screen TV! Provided with friendly media software, this home digital media center plays up to 11 popular video formats as well as most popular picture and audio formats. With multiple connections available you can connect your PC, use digital AV devices via the 2 front side USB ports, connect your standard DVD player, and best yet install a 3.5" SATA hard disc of up to 500GB max to record and easily play back all your favorite TV, digital media and internet multimedia files. The provided HDMI connection gives a stunning 720P picture to your TV, while the standard composite and component cables give you plenty of good options to network your various entertainment center devices. The included remote control also provides easy access to media player functions and menus. At Chinavasion we continuously expand our product selection to give you the greatest selection of hi-tech products for resale, OEM, or company/personal use at direct wholesale prices. We make it easy with direct shipping and no M.O.Q (minimum order quantity), so login now and order yours today.